We are moving again. Yep, again. We are crazy. We are moving in 15 days. 10 of those days we will be on vacation. But, we're doing what we need to do. Just days ago, Ryan & I decided returning to Rexburg to have him finish his degree there was the right thing to do for our family. Yesterday, he searched the tiny town for a place our family could call home, thankfully he was successful. We'll be returning to the 5 square mile town, with smiles but sad hearts. Utah has been good to us this summer. I am especially sad we're missing the state fair. I was *really* looking forward to some deep fried twinkies. But, on the bright side....I'll be back by my favorite cupcake shop! I'm still got 20 flavors to try and photograph. Leave it to me to be scrapping when I should be packing. Like I've said before I have a really hard time scrapping event photos. I don't know if it's the pressure of doing justice to the wonderful memories or if I just prefer the everyday stuff. 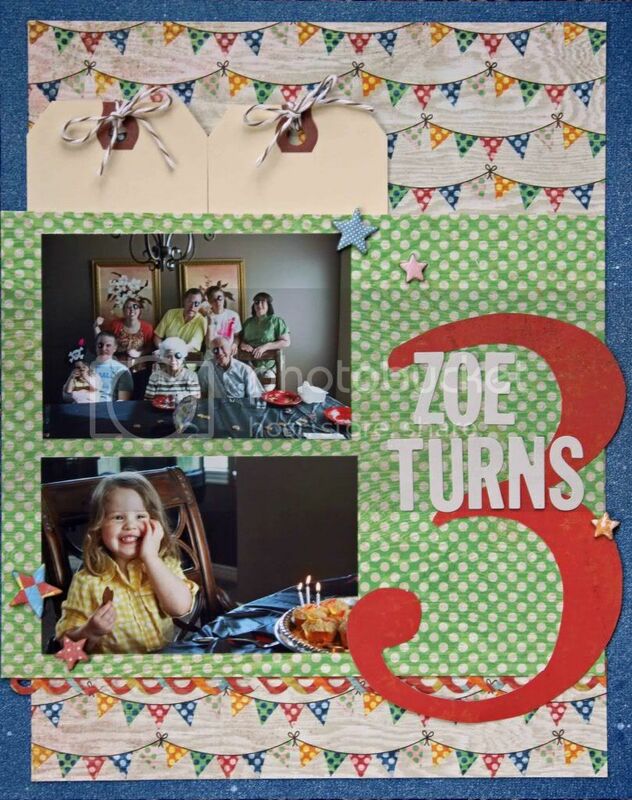 I haven't done too many pages of Zoe's 3rd birthday. We had a pirate party, complete with eye patches. I'm so glad I took a photo of everyone in the eye patches, it will bring me smiles for years to come. Have a wonderful weekend and friends on the East coast, stay safe! Good luck with your upcoming move! And I do the same thing-completely block it out and pretend it isn't happening and start scrapping! Well I'm excited you are coming back! And just so you know, the college avenue deli has deep fried twinkles, or anything else you want deep fried! You're catching up to me in moves! I'm glad you guys finally have settled on a plan though, I bet that feels good too. Good luck with your move sweetie! Loves. I love the design with the big 3 ! Congrats on being in the top40 at the nook !